My latest book Next Generation Databases is now available to purchase! You can buy it from Amazon here, or directly from Apress here. The e-book versions are not quite ready but if you prefer the print version you’re good to go. I wrote this book as an attempt to share what I’ve learned about non-relational databases in the last decade and position these in the context of the relational database landscape that I’ve worked in all my professional life. The final chapter speculates on how databases might develop in the future. Spoiler alert: I think the explosion of new database technologies over the last few years is going to be followed by a consolidation phase, but there’s some potentially disruptive technologies on the horizon such as universal memory, blockchain and even quantum computing. The relational database is a triumph of software engineering and has been the basis for most of my career. But the times they are a changing and speaking personally I’ve really enjoyed learning about these new technologies. I learned a lot more about the internals of the newer database architectures while writing the book and I’m feeling pretty happy with the end result. As always I’m anxious to engage with readers and find out what you guys think! Once of the concepts I found difficult initially when looking at non-relational systems is the concept of the vector clock. Some databases – like Cassandra - use timestamps to work out which is the “latest” transaction. If there are two conflicting modifications to a column value, the one with the highest timestamp will be considered the most recent and the most correct. Other Dynamo systems use a more complex mechanism known as a vector clock. The vector clock has the advantage of not requiring clock synchronization across all nodes, and helps us identify transactions that might be in conflict. Despite its name, the vector clock does not include any timestamps. Rather it is composed of a set of counters. These counters are incremented when operations complete, in a similar way to the traditional System Change Number pattern that we are familiar with from relational systems like Oracle. The set contains one counter for each node in the cluster. Whenever an operation occurs on a node, that node will increment its own counter within its vector clock. Whenever a node transmits an operation to another node it will include its vector clock within the request. The transmitted vector clock will include the highest counter for the transmitting node as well is the highest counters from other nodes that the transmitting node has ever seen. The clocks are “concurrent” in that each node has some information that is more up to date than the other node. In this case we can’t choose which update is truly the more correct. In the example the vector clocks start out set to 0 for all nodes (1). Updates to nodes from external clients caused the nodes to increment their own element of the vector clock (2). When these changes are propagated to other nodes, the receiving node updates its vector clock and merges the vector clocks from the other nodes (3). Event (H) occurs when node 2 receives the vector clock (F) from node 1 and (G) from node 3 (4). Each of these vector clocks contain elements higher than the other - vector clock F has the higher value for node 1, while vector clock G has the higher value for node 3. There is no way for node 2 to be sure which of the two vector clocks represent the most up-to-date data - each of the sending nodes “knows” something that the other node does not, and consequently it’s not clear which of the two nodes “knows” best. For those of us from the world of strictly consistent databases like Oracle, think of the vector clock as a set of System Change Numbers from each system. We examine the SCNs from each node to see if there are nodes that might not have seen all the changes that have been recorded on another node. Revert to last write wins: two updates are unlikely to have occurred at the exact same nanosecond, so one will have a higher timestamp value. We could decide that the highest timestamp “wins”. Keep both copies, and require that the application or the user resolve the conflict. Somehow merge the data. This is the approach taken by the original Dynamo which managed Amazon’s shopping cart. If there are two conflicting shopping carts they are merged and the worst that can happen (from Amazon’s point of view) is that you buy some things twice. Another merge can occur with things like counters: rather than having one counter increment overwrite another, we can deduce that both operations wanted to increment the counter and increment it twice. A special class of data types: Conflict-Free Replicated Data Type (CRDT) exist that allow these sort of merges to be predefined. There are advocates for the vector clock – such as the architects of Riak - , and advocates for the timestamp system used in Cassandra. Neither party disagree about the concrete implications of the two approaches: they differ on the desirability of the consequences. Last Write Wins represents a simpler model for the application developer and administrator, Vector clocks allow for conflicts to be identified but which must then be resolved. In a later post I’ll give an example of how you programmatically resolve conflicts in Riak. Couchbase recently announced Non-first Normal Form Query Language (N1QL) – pronounced “Nickel” – a virtually complete SQL language implementation for use with document databases, and implemented within the Couchbase server 4.0. I recently took a quick look. The UNNEST command allows us to perform the equivalent of joins between parent and children documents where the child documents are nested within the parent. N1QL also allows us to join across disparate documents, providing that one of the document collections contains a reference to the primary key in the other. N1QL also contains DML statements allowing us to manipulate the contents of documents, and DDL statements allowing creation and modification of indexes. N1QL is ambitious attempt to bring SQL into the world of document databases. It’s interesting to consider that as the same time that companies like CouchBase are introducing SQL support into their database, that companies like Oracle are introducing strong JSON support into their SQL-based database. It would seem that the two worlds are coming together. 2018 Update: You can download this and other sample schemas we use in dbKoda from https://medium.com/dbkoda/mongodb-sample-collections-52d6a7745908. I wanted to do some experimenting with MongoDB, but I wasn’t really happy with any of the sample data I could find in the web. 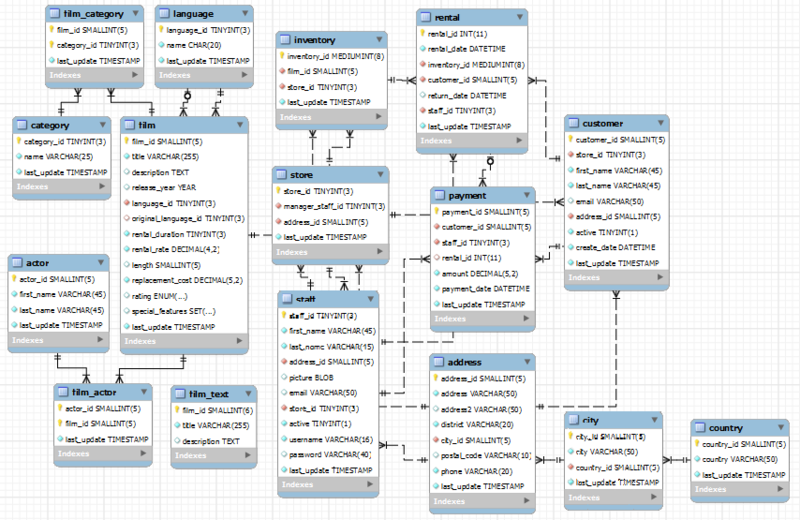 So I decided that I would translate the MySQL “Sakila” schema into MongoDB collections as part of the learning process. For those that don’t know, Sakila is a MySQL sample schema that was published about 8 years ago. It’s based on a DVD rental system. OK, not the most modern data ever, but DVDs are still a thing aren’t they?? You can get the MongoDB version of Sakilia here. To load, use unpack using tar zxvf sakilia.tgz then use mongoimport to load the resulting JSON documents. On windows you should be able to double click on the file to get to the JSON. The Sakila database schema is shown below. There are 16 tables representing a fairly easy to understand inventory of films, staff, customers and stores. When modelling MongoDB schemas, we partially ignore our relational modelling experience – “normalization” is not the desired end state. Instead of driving our decision on the nature of the data, we drive it on the nature of operations. The biggest decision is which “entities” get embedded within documents, and which get linked. I’m not the best person to articulate these principles – the O’Reilly book “MongoDB Applied Design Patterns” does a pretty good job and this presentation is also useful. My first shot at mapping the data – which may prove to be flawed as I play with MongoDB queries – collapsed the 16 tables into just 3 documents: FILMS, STORES and CUSTOMERS. ACTORS became a nested document in FILMS, STAFF and INVENTORY were nested into STORES, while RENTALS and PAYMENTS nested into CUSTOMERS. Whether these nestings turn out to be good design decisions will depend somewhat on the application. Some operations are going to be awkward while others will be expedited. Looks like I have to fix some float rounding issues on customers.rentals.payments.amount . The code that generates the schema is here. It’s pretty slow, mainly because of the very high number of lookups on rentals and payments. It would be better to bulk collect everything and scan through it but it would make the code pretty ugly. If this were Oracle I’m pretty sure I could make it run faster but with MySQL SQL tuning is much harder. Code is pretty straight forward. To insert a MongoDB document we get the DBCollection, then create BasicDBObjects which we insert into the DBCollection. To nest a documnet we create a BasicDBList and insert BasicDBObjects into it. Then we add the BasicDBList to the parent BasicDBObject. The following snippit illustrates that sequence. It's mostly boilerplate code, with the only human decision being the nesting structure. Anyway, hopefully this might be of some use to those moving from MySQL to MongoDB. Comments welcome!